Our safety identification products include safety tape that prevents accidents by increasing visibility of hazards, pavement marking tape to temporarily redirect traffic around constuction sites, truck reflective tape to illuminate trucks and school buses to a brightness of 700-100 candle power intensity, non-slip tape to apply to high traffic areas where dangerous or slippery surfaces may cause accidents. 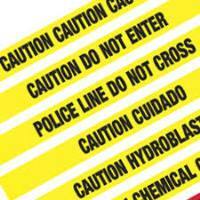 We also carry underground tape which quickly warn excavation crews of the existence of buried pipes and cables. Other products include; bilingual tape, floor stickers, tape applicators, safety labels, pipe markers for workers to know what is flowing inside the pipe and the direction that it is traveling, glow in the dark tape, plus many other products. The safety tapes that we offer are high quality and in stock for fast shipping.